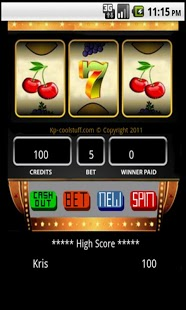 Description: Very Simple Slots is a casino style slot/fruit machine with a Very Simple Interface. Very Simple Slots is fun and very simple to play. Please try the trial version before purchasing the full version. Thank you! 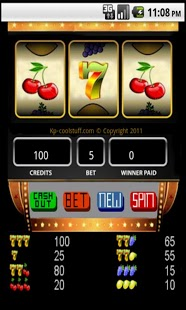 Very Simple Slots has been tested on the Android Comet running API level 8(Android 2.2). I have also tested the app using API level 11(Android 3.0), and API level 12(Android 3.1) using an AVD (Android Virtual Device). If anyone has problems on any device or API Levels, Please let me know. Send emails to krispy1001@kp-coolstuff.com.